Water hickory is a medium to large tree with a long, clear trunk, buttressed base, and narrow, irregular crown. Leaves are alternate, feather-compound, 9–15 inches long, with 7–15 leaflets; leaflets lance- to egg-shaped, curved, 2–5 inches long, with long-pointed tip; margins finely to inconspicuously toothed. Upper surface dark, smooth; lower surface hairy, especially along veins and stalk. Yellow in fall. Bark is gray-brown, often red-tinged, splitting into long, loose, platelike shaggy scales, brittle. Twigs are slender, red-brown or gray, hairy, end bud slightly flattened, covered with tiny yellow scales. Flowers April–May; male and female flowers separate on same tree; male catkins hairy, solitary or in threes; female flowers 2–6 per spike. Fruits September–October, pear- to egg-shaped nuts, often clustered, 1–1½ inches long, 1 inch wide, noticeably flattened compared to other hickory nuts, with a thin, 4-winged husk having bright yellow scales, splitting at the base. Nuts flat, reddish, bitter. Similar species: Pecan is similar but has a broader native range in Missouri than water hickory, and although it appreciates moist bottomland soils, pecan is not a swamp tree. Its nuts are sweet, larger, cylindrical (not flattened as in water hickory), with irregular black markings on the shell. Its bark isn't shaggy like water hickory. Water hickory and pecan can hybridize and produce offspring with intermediate characteristics. Occurs in swamps and wet bottomland forests, on ground that is often under water during part of the year. Associated with bald cypress, water tupelo, swamp cottonwood, overcup oak, water locust, and Drummond's red maple. 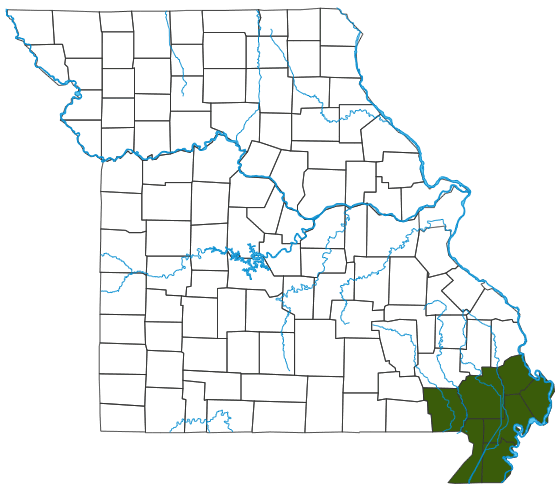 In Missouri, natural populations are limited to the Bootheel. This is a slow-growing tree that generally does not begin producing fruits until after age 20. It readily hybridizes with pecan where the two species occur together on the same site. Uncommon in our state; found only in the swamps of the southeastern Bootheel. Total range is from east Texas to Florida, to Virginia, to southern Indiana and Illinois and southeastern Missouri. The wood is hard to work, brittle, and considered inferior to that of other hickories. It is sometimes used for fuel, posts, and props. The nuts are bitter and inedible. The swamp habitat these trees are a part of is crucial for natural flood control. The nuts are swallowed by wood ducks and mallards and are eaten by squirrels and other small mammals. With their shade and effects on soils and water movement, water hickory and other swamp trees help create lowland habitat critical for a multitude of species.